Today was a rainy day and so we loaded up the family and headed to the fabric store. I was in search of some boy fabric. I found a whole lot of fabric (more than I needed) but I LOVE the fabric store. Here are some of the fabrics we currently have in stock to make fabric books, I can’t wait to start making some of these. The pirate and the giraffe are two of my favorites. Take a look and imagine the great books and how cute they will turn out! This was definitely one of my favorite books to do. I had really been wanting to make a big brother/little sister type of book and while my daughter and nephew were playing this summer we got some great shots that had to be put into a book. My nephew and daughter are both really into books, which is one of the main reasons we started Hullabaloo Stories. 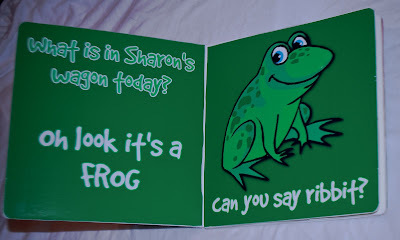 As mentioned in my post about another book made for me nephew he is a big fan of frogs and when I was looking for fabric to make this book I found great fabric for it and the idea of making a book for both of them that was the same but a girl and boy version came to life. Ainsleigh book is pink and Jackson’s is blue. The story line and all the photos are the same the only difference is the fabric color and the fact that there are two books! I of course love doing books for everyone, but once in a while I get to do a really special book. 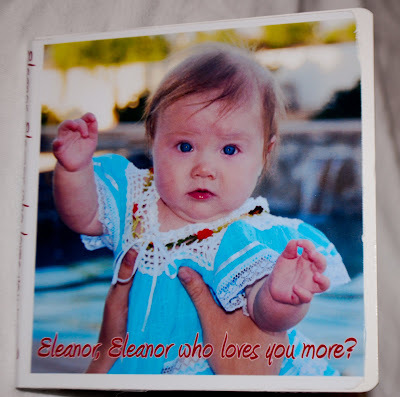 This book was made for one of my very closest friends and her daughter. Little Miss E has a cousin on the way early next year so hopefully I will get to make the cousins a book too! 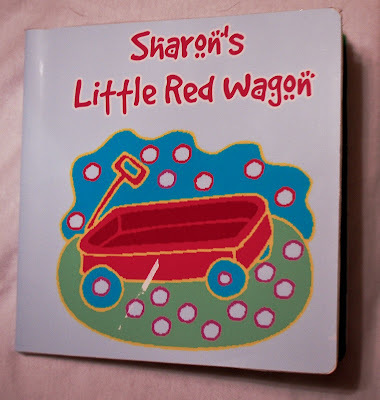 Sharon’s Wagon "Custom Board Book"
Sharon is a very wonderful woman who I took prenatal yoga, mom and baby yoga as well as baby sign language from. 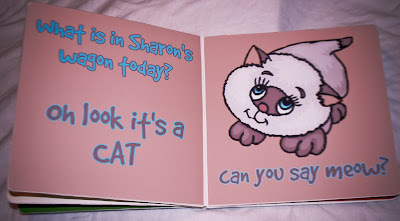 During sign language class she always gets out books for the kids to read, so I thought what a better way to say thank you is to give her a special customized Sharon book! For our loyal followers and our new fans, we wanted to let you know about some new updates here at Hullabaloo Stories. After taking some time to enjoy the summer with our daughter who turned one in June, we have finally finished our Web site!!! Visit us at Hullabaloostories.com ( if you’re viewing the RSS feed, just click on the circle logo to the left) to place your orders. We also have updated our blog with some recent books that have been made. On top of all of that we have our etsy store and our ever growing facebook fan page! We are really excited about everything going on at Hullabaloo Stories and cannot wait to make a custom story for your family. Will has a pretty big family and his parents really wanted him to have a fun way to look at photos and learn all about his big loving family. 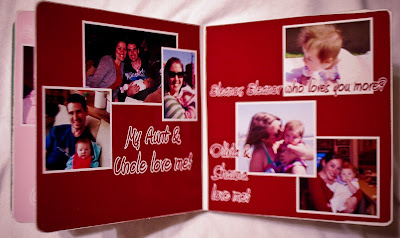 A custom board book was perfect for the little guy. family, special occasions, Who Loves Baby? 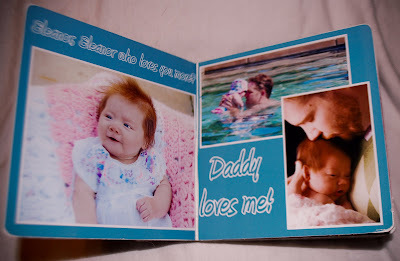 This custom fabric book was made for the “D” family whose beautiful little girl wanted something really special for her daddy’s first father’s day. We chose some very cute fabric and made a great memory for the entire family to enjoy! 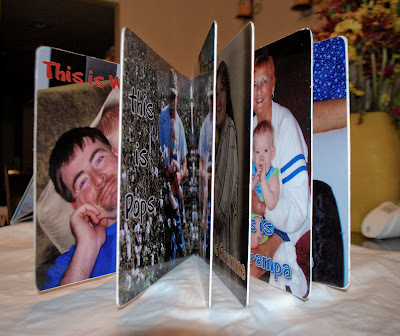 This large 8×8 book was made for a daddy and son who will be seperated due to a deployment in the near future. What a great way for the little guy to read all about his dad while he is away. These two couldn’t be any cuter together. They obviously have so much fun together and since the “G” family has a dog that is considered a member of their family we went with a cute doggy fabric for this first father’s day present.